Motorola today updated the Touchless Control application that's found on the Moto X. The improved application accepts more Google Now commands without requiring users to unlock their phones first. According to Motorola, personal information, such as emails and messages, are still protected by the PIN code, but users can speak their PIN code to unlock the device via Touchless Control. The app also offers a new alert tone when users say "OK Google Now." 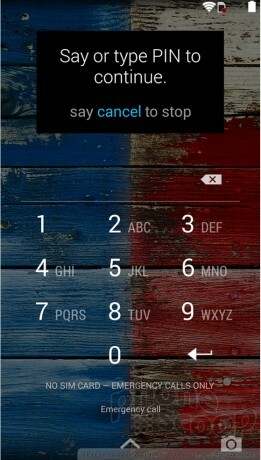 This version of Touchless Control is available only to devices running Android 4.4. KitKat and up. The Moto X is a better pick for Verizon customers than the newest Droids. Here is Phone Scoop's take on Motorola's latest Android smartphone. Sprint's version of the Moto X varies little from the AT&T and Verizon models, but still manages to stand out for one reason. Read Phone Scoop's full review here. Motorola today announced the availability of a digital tattoo that can be used to unlock the Moto X. The tattoo is actually an adhesive based on VivaLnk’s eSkin technology. Motorola today announced the College Collection, a series of pre-designed Moto X handsets that reflect the colors of more than 40 colleges and universities. Motorola also added nine more back colors and three new accent colors to allow for further customization of the Moto X.
I wonder how well it would work if you are at an auction, or playing battleship. Plus, you have those annoying friends who will just shout out random numbers. I don't see any practicality for a feature like this. Zero. Who the hell wants to say "^^ OK, GOOGLE NOW! ^^" ? So freakin' lame.